Measures based on mutual information are useful for analyzing functional connectivity patterns, obtained from neuronal spike trains, local field potential recordings or fMRI/PET voxel time series. However, functional connectivity allows only very limited insights into patterns of causal interactions within the network. 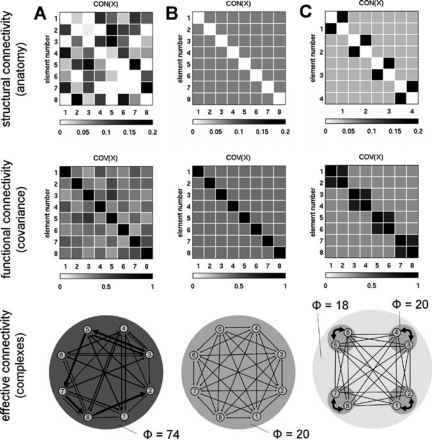 Patterns of functional connectivity are statistical signatures of hidden causal processes occurring within and among specific and time-varying subsets of neurons and brain regions. The identification of which subsets are currently causally engaged in a given task requires the inclusion of and reference to a structural model in order to access effective connectivity patterns. Effective connectivity attempts to reconstruct or "explain" recorded time-varying activity patterns in terms of underlying causal influences of one brain region over another (Friston, 1994; Buchel and Friston, 2000; Lee et al., 2003). This involves the combination of (essentially covariance-based) functional connectivity patterns with a structural system-level model of interconnectivity. A technique called "covariance structural equation modeling" is used to assign effective connection strengths to anatomical pathways that best match observed covariances in a given task (Mcintosh and Gonzalez-Lima, 1994; Hor-witz et al., 1999). Applied in different cognitive tasks, this technique allows the identification of significant differences in effective connectivity between a given set of brain regions, illustrating the time- and task-dependent nature of these patterns. Another approach called "dynamic causal modeling" (Friston et al., 2003; Stephan and Friston, 2007) uses a Bayesian framework to estimate and make inferences about interregional influences, explicitly in the context of experimental changes. A caveat concerning these and other approaches to extracting effective connectivity is that they usually require assumptions about the identity of participating brain regions and the patterns and direction of cross-regional influences between them. Note that unlike MI(A,B), effective information may be non-symmetrical, i.e. EI(A ^ B) = EI(A ^ B), owing to non-symmetrical connection patterns. Furthermore, the estimation of effective information requires perturbations of units or connections. Currently, this measure of information integration has only been tested in computer simulations of small model systems with varying anatomical architectures (Tononi and Sporns, 2003; Fig. 6). 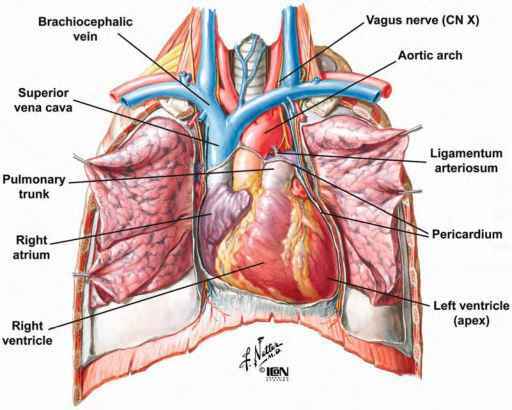 The results indicate that information integration is maximized by two main attributes of the anatomical connection pattern. First, each element maintains a different connection pattern, or connectional "finger-print", a property that strongly promotes regional functional specialization. Second, the pattern maintains global connectedness and ensures that a large amount of information can be exchanged across any bipartition of the network, which in turn promotes global functional integration. Simple models of the connectional organization of specific neural architectures, such as the thalamocortical system, are found to be well suited to information integration, while others, such as the cerebellum, are not. Neural architectures that are highly capable of integrating information are also associated with consciousness. Tononi (2004) has suggested that consciousness critically depends on the ability of a neural substrate to integrate information and is therefore tied to specific and quantifiable aspects of effective brain connectivity. well as fMRI time series (Roebroeck et al., 2005). Additional causality measures can discriminate between direct causality and effects mediated through extraneous system components (see also Liang et al., 2000). Bernasconi and Konig (1999) developed statistical measures that allowed the detection of directed dependences within temporal brain data sets. Schreiber (2000) defined a measure called transfer entropy, which is able to detect directed exchange of information between two systems by considering the effects of the state of one element on the state transition probabilities of the other element. This yields a non-symmetric measure of the effects of one element on the other, exploiting the entire system's temporal dynamics. The experimental application of measures of effective connectivity presents a number of difficult problems. Structural equation modeling and dynamic causal modeling are sensitive to choices made about the underlying structural model, while causal measures based time series analysis are prone to issues surrounding sample sizes or systematic sampling biases. Effective information, as defined above, shares some of these problems, in addition to issues related to its use of systematic perturbations, which are likely to be difficult to estimate in real neuronal systems. These difficulties notwithstanding, some promising avenues towards extracting effective connectivity from brain data have recently been pursued. The combination of transcranial magnetic stimulation (TMS) with functional neuroimaging, for the first time, allows the quantification of effects of localized perturbations on extended brain networks engaged in the performance of specific tasks (Paus, 1999; Pascual-Leone et al., 2000). Using a combination of TMS and high-density electroencephalography Massimi et al. (2005) reported a striking reduction in the extent of cortical effective connectivity during non-REM sleep compared to waking. This state-dependent difference is recorded in the same individual, presumably existing within an identical structural connectivity pattern. A major implication of this breakdown of effective connectivity during non-REM sleep is that it points towards a crucial role of causal influences between brain regions associated with information integration as a neural basis for consciousness (Tononi, 2004).